A game is played between two teams. During the course of a game, four matches are played by at least two players from each team against each other. The winner of the game is determined by the total number of points won within all matches. Friends, family and spectators are encouraged to attend and watch – but not participate or aide – each game! A team is a collection of eight to twelve players, boys and girls of any ability, who work together during the course of a game against another team. 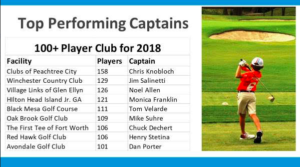 Each team is Captained & Coached by one of our ClubCorp Management Staff from PTC or White Oak. A scramble is a popular format that encourages teamwork and problem solving. Each player will tee off at the beginning of each hole. The team then selects their best shot of the two and then each player plays again from the spot of the selected shot. Repeat this process until the ball is in the hole. The team with the lowest score wins the hole. Stroke Maximum: Triple Bogey is the stroke maximum on a hole. 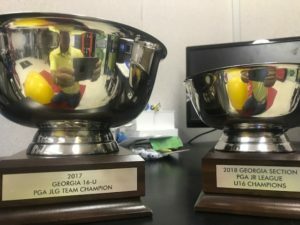 No hole in PGA Jr. League Golf can be won with a triple bogey. Any team failing to finish the hole after reaching 2-strokes over par should pick-up. If both teams are forced to pick-up, then the hole is halved. A match consists of two teammates (or three, with a substitute) competing against a similar grouping from the opposing team in a fun, nurturing scramble format. The match lasts for nine holes and is broken up into three 3-hole segments called “flags”. 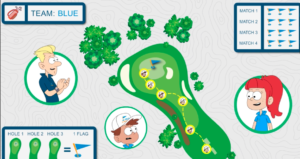 Flags are 3-hole segments of each match. Since each match is played over the course of 9 holes, there are three flags per match. Whichever team wins the most holes within each flag (i.e. 3 holes-to-0 or 2 holes-to-1 hole), wins the corresponding flag. Each flag won by the team is worth one point. Each tied flag won by the team is worth a half point. The team with the most points at the end of the game wins.Since there are four matches in each game, and each match is played for a maximum of three points, there are a maximum of 12 points total in each game. ***PACE of PLAY policy – All 13U League Matches must be completed in 2:30 minutes… if a group has not finished a hole, that hole is tie. A group must not start a new hole after 2 hrs 20 minutes after the start of the Matches. Have parents assist us keeping the kids moving by limited the over coaching on the course. Let the Kids Enjoy the Play! 13U League Parents are encouraged to bring their own golf cart each week – Each course has a limited # of carts available as they are open for member play at the same time we have our matches. Also – each family is limited to one club owned golf cart. If an additional cart is needed, a cart fee will be charged. 17U ( Next Level League ) players will be split into teams and all players will have the opportunity to play 9 holes – Each 17U Team (BRAVES, CRUSHERS & EAGLES) will create 2 Person Teams (within their BIG Team) and play a Better Ball Format and post 1 score for each 2 person team. A determined # of scores will be taken each week to determine weekly team winners. Triple Bogey Max will still be in play. Juniors will walk / carry their own bag or use a pull cart – Parent / Spectator carts are not included in the league fee, but may be purchased weekly from the golf shop. There is no charge for Personal Carts. Players maybe shuttled in golf carts in between holes, but all Carts and Parents must remain on the cart path. We do encourage parents to help look for stray golf balls, but our goal is to simulate other Junior Tournament events. Thanks for your support. 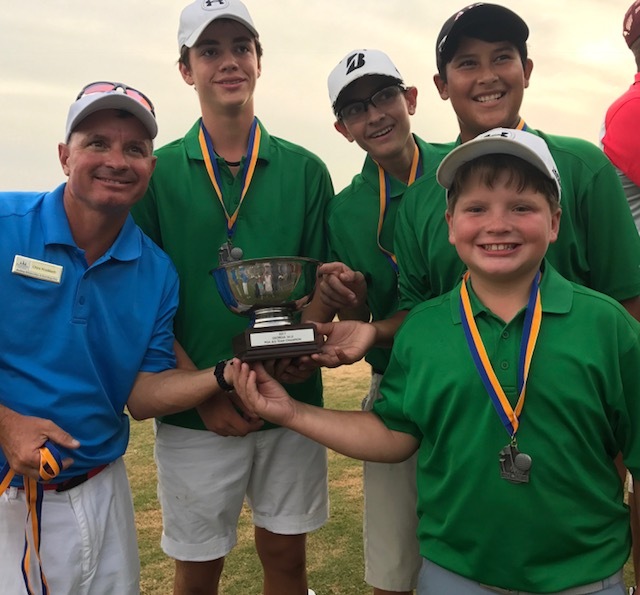 SPRING & FALL Junior League Cost: $200 for ClubCorp Golf Members – $250 for Social Members/ Guests – with $75 due at Registration and the balance paid to your respective coach at the first practice. 17 U ( Next Level League ) players will be split into teams and all players will have the opportunity to play 9 holes – Each 17U Team ( Braves, Eagles & Crushers) will create 2 Person Teams (within their BIG Team) and play a Better Ball Format and post 1 score for each 2 person team.A determined # of scores will be taken each week to determine weekly team winners. 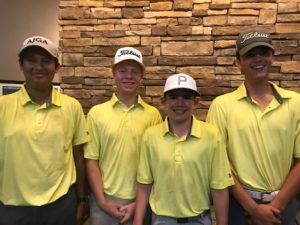 Triple Bogey Max will still be in play.Juniors will walk / carry their own bag or use a pull cart – Parent / Spectator carts are not included in the league fee, but may be purchased weekly from the golf shop. There is no charge for Personal Carts. Players maybe shuttled in golf carts in between holes, but all Carts and Parents must remain on the cart path. We do encourage parents to help look for stray golf balls, but our goal is to simulate other Junior Tournament events. Thanks for your support.